If my cellphone happens to survive being dropped in the sink, I’m about as happy as can be. Apparently, I’ve been setting my standards way too low when it comes to the underwater capabilities of my cellphone. If you’re not quite satisfied with your phone just surviving a dip in the water, you should check out the Alpha UWCP that allows for you to talk on the phone while you’re out diving. The Neptune Space full face mask has a microphone and speaker built into it. 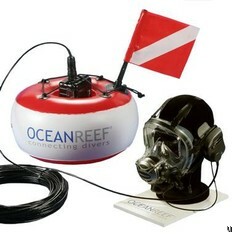 The mask is then wired to a 40 meter cable that is wired to the box within the buoy. That cable can be modified upon request if 40 meters isn’t to your liking and the cable can also be detached from the diver if they choose. The buoy is plenty stable due to a water reserve bottom pocket. Within it is a top pocket that provides a secure spot for the box. That box is water resistant and can be connected by Bluetooth to a cellphone. It functions on a 9V alkaline battery. The entire thing will cost you $1,790 from Sky Mall.